Hey everyone. I don’t know what the weather is like with you but we’ve had a heat wave here in Northern Ireland. For the past week we’ve been having temperatures of 26+’C. This morning my girls couldn’t face going outside as they said it was too hot – at 9:30am!!! To try and keep the girls busy for at least half a minute I thought I’d do a bit of craft with them. 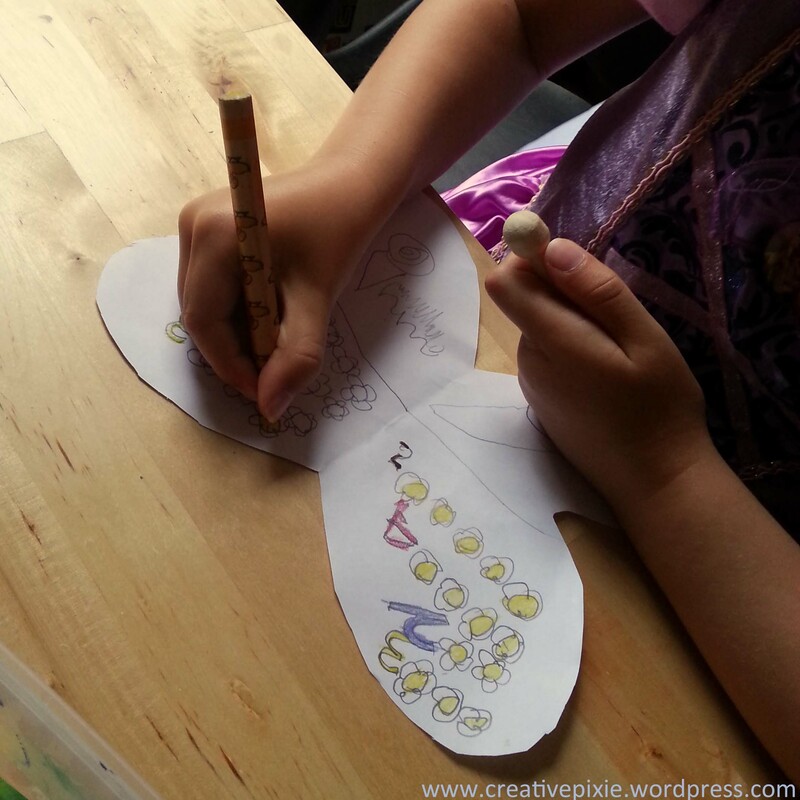 I recalled seeing a post by Izabel on the Easycraftsforchildren blog for wooden peg butterflies. 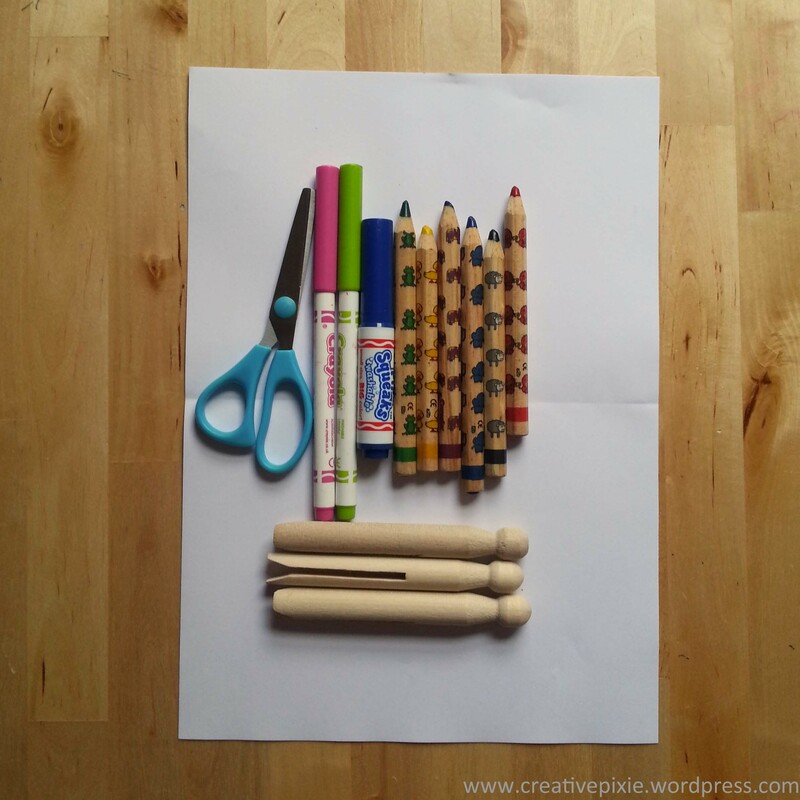 I had some wooden dolly pegs which I had used as props for a previous photo shoot, you can get some here. 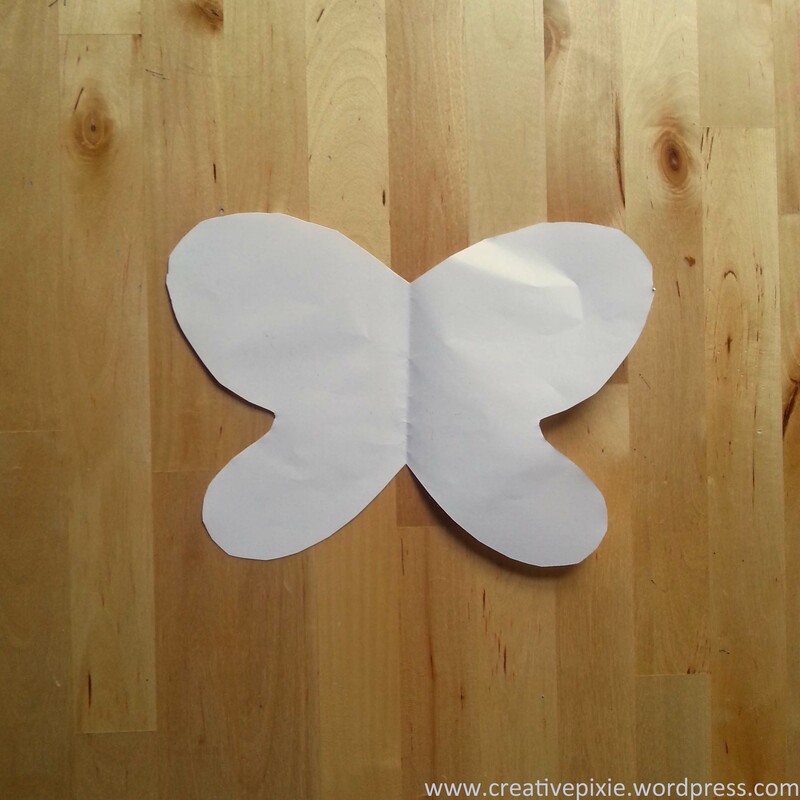 You can make some dolly peg butterflies by following these steps. 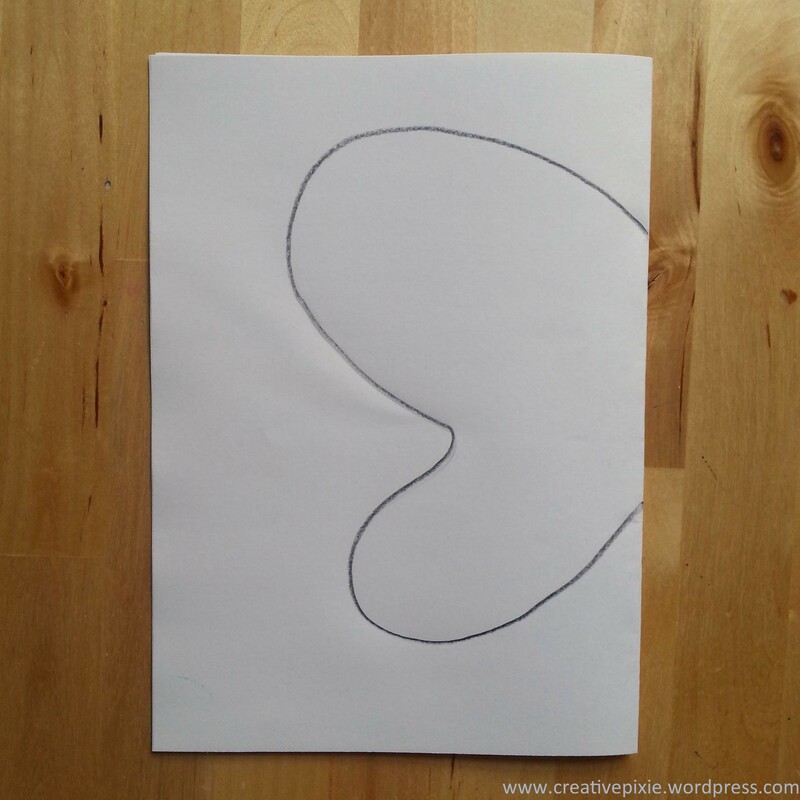 Fold the paper in half and draw half a butterfly. 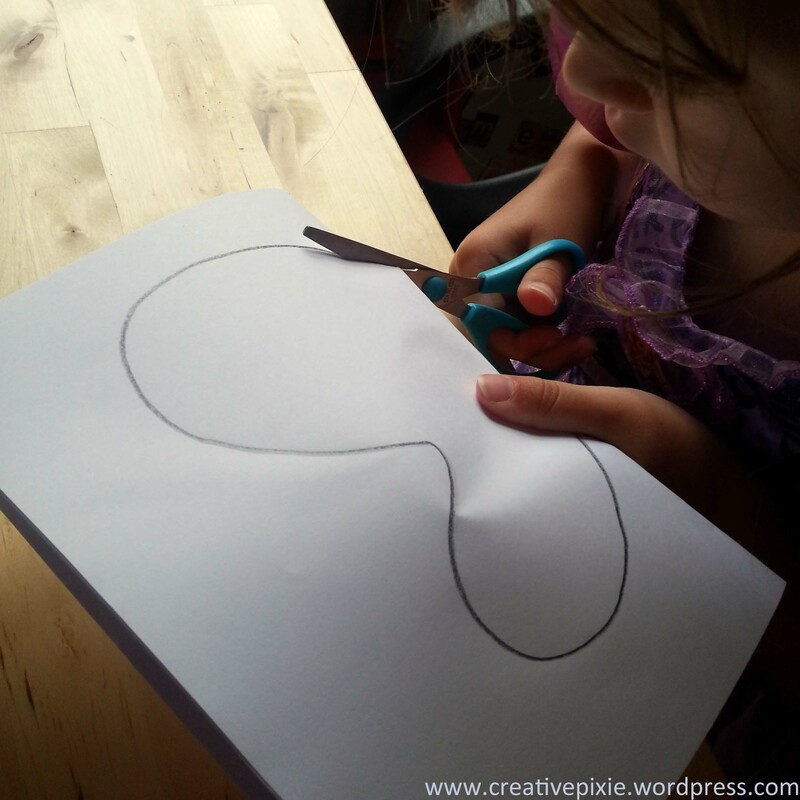 While keeping the paper folded cut round the butterfly shape. Decorate the butterfly however you choose. Cut a notch in the top of the butterfly and side the peg over the middle of the butterfly and sellotape to secure. 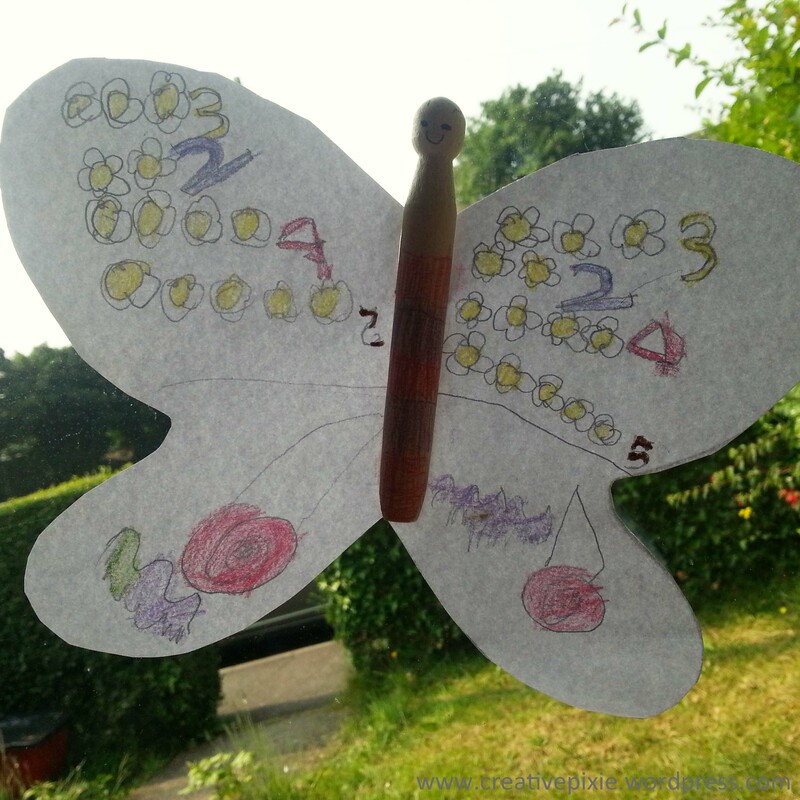 Decorate the peg to coordinate with the butterfly, not forgetting to draw on some eyes and antenna. Miss P was very happy with her butterfly and was even happier when I told her I was making here a dress from some fabric I had left over (from my crochet bag project). 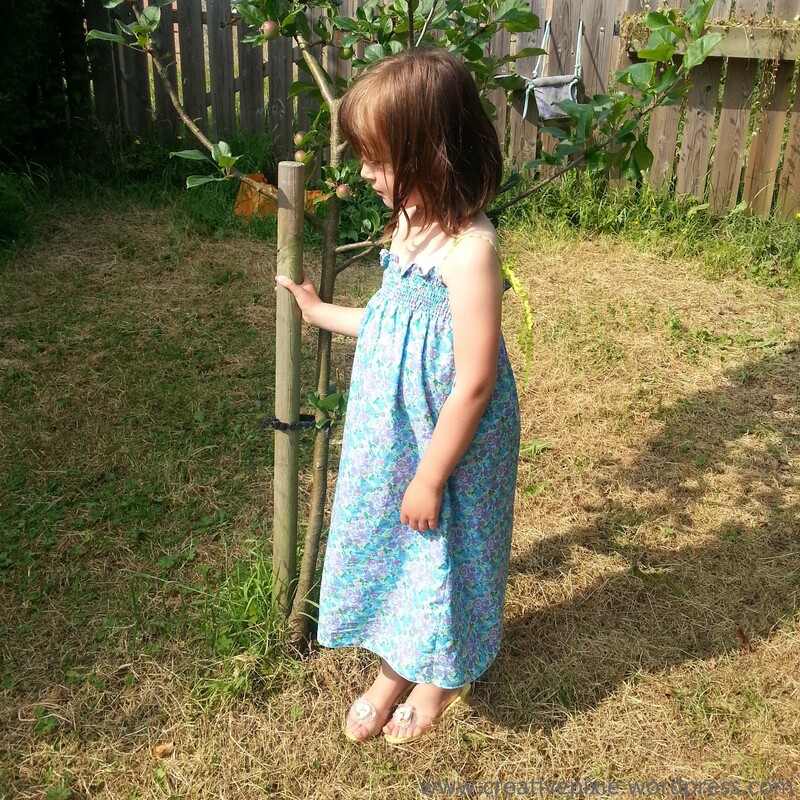 I decided to make a simple dress using some shirring elastic. I had not used this before but had bought some after I saw it used on ‘The Great British Sewing Bee ‘ TV show so had a go at making the dress. I did 10 rows of shirred elastic and I used the french seam technique on the inside (I hope to do some tutorials on these techniques at some point). Here is the finished dress. 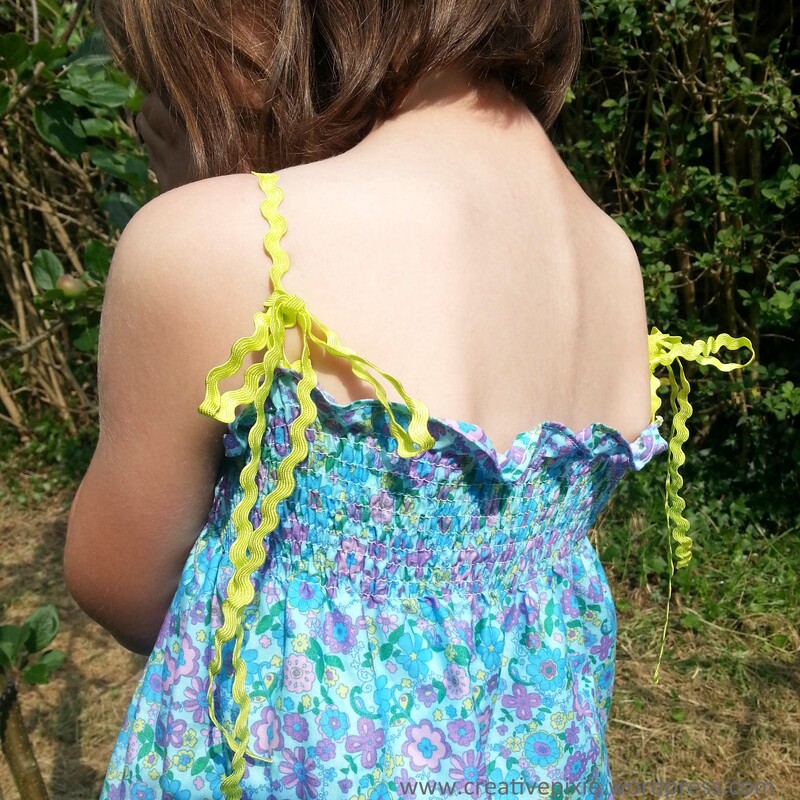 I used some lime coloured ric-rac ribbon as skinny straps and tied in them bows behind her back. I really enjoyed making this dress so hope to make some more over the summer period. Even though things have been a bit quiet on the blog front over the past couple of weeks be assured that I am still crafting, in fact I have some exciting news regarding this (which shall be shared at a later date). 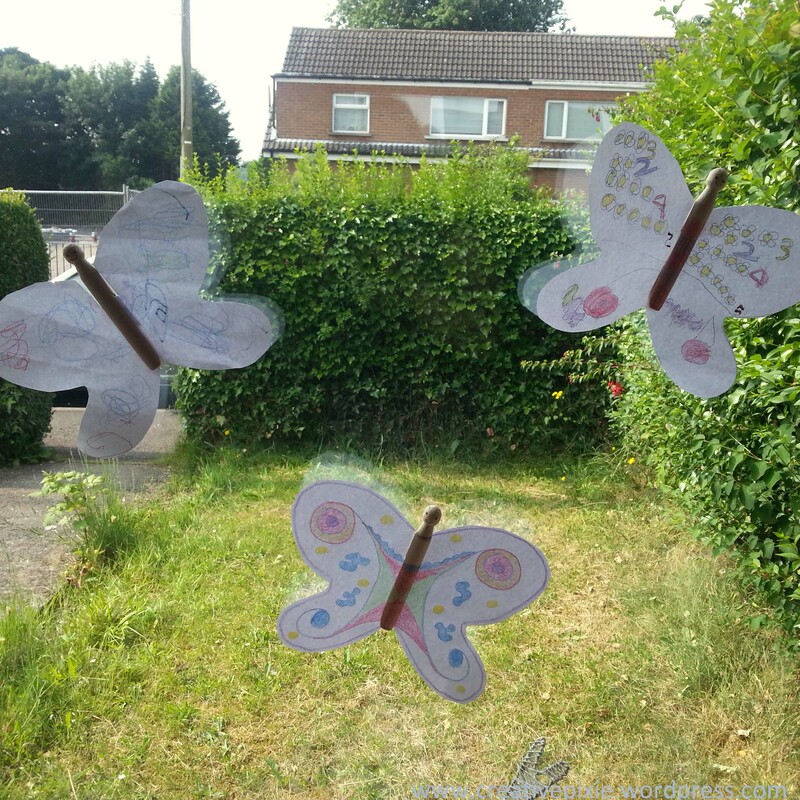 You have made some lovely window decorations, it has been hot here on the east coast this week too but I have been stuck in a stuffy office so am looking forward to some time in the garden tomorrow, hopefully. Love the butterfly and the dress!!!! I hope your heatwave breaks soon, we had some unusual heat here but it broke a couple of days ago, It’s nice to be able to wear a variety of clothes again without being overly hot. Love the dress, simple enough I think I will try to make a couple for my granddaughters. Looks like there is less heat here today. The dress was really simple to make so I’d recommend it (that’s if you’ve used the elastic before).I hope you’re keeping well. Will be doing this. Thank you. And the dress is super cute. I’m waiting on getting a sewing machine so I can start making my daughter (she’s two) dresses as well.And yes, it has been a heat wave here in America as well. It’s cooler today though. Be a encouraged. Be inspired. Be who He created you to be. Thanks for your message. I’ve been doing loads of sewing on my machine lately and I’m starting to think that I may need a new one… I best start saving up. Well we shall save together lol. How much do they cost where you are? £150 for a basic up to £900 for a fancy one. I’ll have to do some research to see what is worth getting. Oh ok. Yes, me too. I have been researching to see the wisest investment. Oh I love her dress. ..wonder if I can make some for my grandchildren. Love the butterflies on the window too! Thanks. The dress was easy to make so I’d recommend it if you are able to sew. Thanks I can’t wait to post pics. Thank you for sharing the fabulous butterfly idea! Miss Four made one yesterday using one of my large stash of vintage wooden pegs. She thought it was wonderful. That’s really good to hear, glad she enjoyed herself. I’ll try and post more activities I do with my girls.